YOU’VE LOST THAT LOVING FEELING? 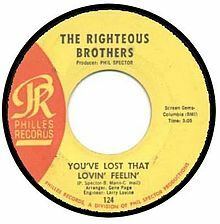 In December 1964, a song titled “You’ve Lost That Lovin’ Feelin’” began to be heard on the radio. It was a song that would one day become the 20th century’s “most played” love song on the radio. It was performed by two guys from California – Bill Medley and Bobby Hatfield; two guys who came to be known as the Righteous Brothers even though they were in no way related. Their stage name came about after a black U.S. Marine, attending one of their early nightclub acts, shouted out approvingly: “That was righteous, brothers!” The label stuck, and the two singers became a distinctive duet, with Bill Medley, the taller of the two, providing the bass-baritone, and blond-haired Bobby Hatfield singing tenor. Their style would later be dubbed “blue-eyed soul,” and there was no doubt about their vocal talent. They had a range and style that helped create a strong and distinctive sound. But they also had another potent ingredient in their music that helped make it distinctive — a music producer named Phil Spector. Spector began collaborating with the many song writers who honed their skills in the cubicles of the Brill Building on Broadway in downtown New York City. One such duo of hit tune makers was the husband-and-wife team of Barry Mann and Cynthia Weil. In creating “You’ve Lost That Lovin’ Feelin’,” Mann and Weil were inspired in part by the Motown classic, “Baby I Need Your Loving” — a hit song by the Four Tops. As the Righteous Brothers’ Bill Medley would later recall: “Barry Mann wrote this ballad and I remember him telling me he wanted to write a song that was like the Four Tops’ records, and so they wrote this ballad and Phil Spector and Barry Mann sat down at the piano and sang it to us. And they both had real high voices. And when they got done I said, ‘Man, that’s a great song for maybe the Everly Brothers but not so much me and Bobby! Our voices were not made for this tune!” Bill Medley could not be more wrong about this right melody! To get up to the really high notes in the song – a song, it would turn out, that builds and builds – there had to be a low and very slow start, so they kept experimenting to try to find just the right start and sound. The unforgettable opening lyric– “You never close your eyes anymore when I kiss your lips” –was done very uniquely in Bill Medley’s signature deep bass baritone. As a matter of fact, it was so slow and so deep that upon hearing the record, some disc jockey’s thought it was being played on the wrong speed. And speaking of those radio stacks of wax DJ’s, “You Lost That Lovin’ Feelin’”had another quirk about it that made it a problem! The song was too long! It was nearly four minutes in actual play time back during a season when most songs on the radio were in the two minute range. But Phil Spector fixed that by altering the actual 3:50 play time on the disc label by reversing the last two numbers and making it 3:05, which helped get the song past time-conscious music programmers. When the song was finally played, we the listeners knew it was pure gold! The powerful back-and-forth call and response between Medley and Hatfield in their respective baritone and tenor gave the song its dramatic, soulful and legendary flair. Although it was introduced to America in the midst of the British Invasion- when the Beatles ruled the pop charts- “You’ve Lost That Lovin’ Feelin’” hit number one within only two months of its initial release! And it might have been too slow and too long but it became one of the most successful pop singles of its time! Indeed, “You’ve Lost That Lovin’ Feelin’” became the most played love songs in pop radio history, estimated to have been broadcast more than 8 million times in the 20th Century. The 8 million “radio plays” of “You’ve Lost that Lovin’ Feelin’” equals more than 45 years of back-to-back airplay. Yes, 45 years straight of the same song- over and over again! But do you know what is sad to me? It is the terrible fact that the most played love song of our era on the radio is not a love song at all. It is a ballad all about a love that was lost. It is the tale of a passion that once was- and had at one time been so on fire but now could hardly flicker a flame. I believe it also represents a diagnosis of our culture that has been so mislead into thinking that we can receive satisfaction by chasing after things when it is only loving people and prioritizing relationships to be at the very top of our bucket lists that could ever be enough for any human being to live for! We were made to be loved and to love! Right from the beginning of the Bible- we are told that we are special not because of what we have- but because of who and whose we are! God loves us and longs for us to love Him with every ounce of our being! He also knows we are at our best when we come up with random and creative ways to love on one another! Do you know why good love goes bad? Because we stop doing what we at one did! We stop caring like we at one moment had! We don’t go out of our way for God and we don’t look to run that extra mile for one another! We tend to want to get by with as little effort as possible and this rarely results in a beaming bonfire of connection and communication! It ends up with it being so ironic of how two people who at one time were so close- could now be so far away. Rarely do you lose anything when it comes to relationships. You actually have more power than you think you do. You don’t lose that loving feeling! You leave it behind! You stop investing you’re “A” game in one another! You attempt to impress with leftovers rather than preparing a banquet of your absolute best! You have bought into the myth that you don’t need anybody as long as you’ve got your every “thing!” But No “Thing” will ever be enough to fill that gaping hole in your soul! Only love will be enough and that is why without love- all our service and all our steadfastness and all of our stuff come up pretty small. So if you want to regain a little of that “lovin’ feelin’” maybe it is time to get back to the basics of love! I guarantee it will reset the juke box in your blue eyed- brown eyed- green eyed- hazel eyed or whatever color you may be sporting in those sparkling eyes soul!